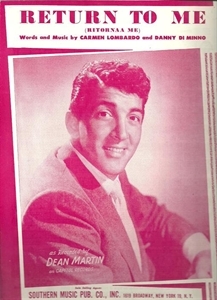 This song was first recorded by Dean Martin, in January, 1958 and to this day, the song remains strongly identified with Martin. “Return To Me” was featured in a 2000 film of the same name. “Return To Me (Regress a Mi)” was recorded in 2012 with Vicente Fernandez and released on Viva Duets.